Home » Noticeboard » Alive News » BRAAAINS!!! Halloween themed fitness classes, spooktacular decorations, a cake sale, raffle and other treats, with all proceeds going to The National Brain Appeal. 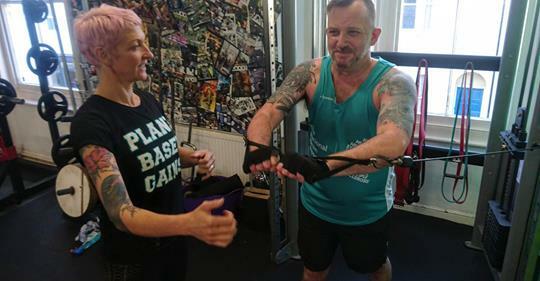 The charity has special meaning for one of our members – Matt Watson – who in 2000, aged 29, collapsed at work in and was subsequently treated at The National having suffered a severe stroke. This charity is dedicated to raising vital funds for The National Hospital for Neurology and Neurosurgery which does pioneering research into stroke and other neurological conditions, and it has access to the best technology for expert diagnosis and treatment, improving the outcome and quality of life for the one in six affected by a neurological condition. “It was just a normal day at work when I suddenly had a headache, and 60 seconds later I collapsed. The stroke left me completely paralysed down the right side of my body, unable to speak, stand or swallow. I was so fortunate to be admitted to The National, where they provided truly ground-breaking stroke care and rehabilitation. During the following months of treatment, I also participated in The National’s research programme, becoming one of the most MRI scanned people in the country! It is undoubtedly due to the immediate and intensive treatment that I received at The National that I am leading a relatively ‘normal’ life today. Their world-renowned research programme continues to improve the recovery of people who have suffered a brain injury or neurological condition. Alive Gym and it’s Superheroes raised a spooktacular £657.07 from classes, raffle, and the cake sale. A big thank you to everyone who took part, and donated money towards this great cause.